Chichester City Ladies boss Aaron Smith is urging his players to enjoy that winning feeling as they continued their excellent start to the season with two wins in four days. The Oaklands Park side have started the National South campaign as they mean to go on by chalking up a 100 per cent record from their first four matches. With 12 points from 12, Chi sit top of the league ahead of a tough test on Sunday when promotion-chasing Coventry United make the trip south (2pm). 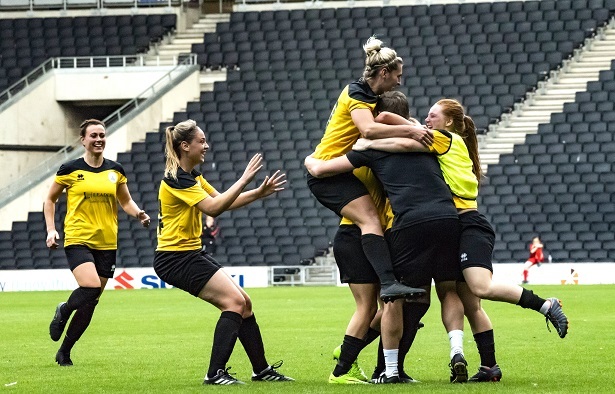 City will go into the match on a high after a late Molly Clark strike sealed all three points at MK Dons last weekend. Then, Smith’s side sealed a second derby win this month over Portsmouth with a 2-1 victory over the Blues at Oaklands Park. Goals from Hollie Wride and Chloe Melton made sure Chi remain unbeaten at the top of the table with the luxury of resting a few players ahead of the crunch match this weekend. Smith, who only took up the reins this summer as Matt Wright moved into a more back office role, said: “We’re going to try [and win every match], it may be a cliché but we will take every game as it comes. Smith was particularly pleased with the effort shown by his side on the road at MK Dons. Playing at the MK Dons Stadium, Chi dominated possession and chances but just could not break the deadlock. After a re-jig at the break, City were able to cope better with the home side’s pressing game. With ten minutes to go, it looked like City would come up short as Clark had a 40-yard strike saved, Tash Stephens headed over and Sara Tubby struck the post when she put the ball between the keeper’s legs. Eventually, their persistence paid off when a short corner was played to Clark, who then curled the ball home from all of 30 yards. Smith admitted he was delighted with the win which was secured after he rested several players ahead of the Coventry match. He said: “Their attitude has been impeccable. They all know why we have done it and we’ve come here with some development players who have gained some valuable experience.